Skin flap surgery is a type of procedure where skin is rearranged to replace missing skin from skin cancer removal, trauma, or burn injuries. The technique involves mobilizing and shifting skin into the hole while maintaining some attachments to preserve the original blood supply of the tissue. Preserving the blood supply is what differentiates flap from graft surgeries, which do not have their original blood supply and will grow new ones after the procedure. To maintain the supply, local skin flaps come from adjacent areas on the body and are moved into place to cover the affected area. More complicated flaps may also be comprised of fatty tissue, muscle, or even bone from the original site, depending on the procedure. Flap surgeries are usually performed on an outpatient basis under either local anesthesia or IV sedation. If sedation is used we require another person to provide transportation back home. At Skin Cancer Consultants in Dallas, TX, our board-certified plastic surgeon Dr. Thornwell Parker is skilled to perform this surgical procedure. Dr. Parker outinely utilizes bilobe flaps, trilobe flaps, and occasionally quadlobe flaps to cover difficult defects on the tip of the nose, an area which can be problematic without the correct training and knowledge to address it. This is because there is no extra skin on the tip of the nose, and that skin is thick and does not stretch easily. Therefore, many doctors fall back on using a graft from another part of the body, but the result often doesn’t match the rest of the nose and may look odd due to different color, texture and thickness. These procedures capitalize on neighboring skin to cover the affected site instead. This results in a much more natural result which is widely preferred. The outer rim of the ear is a frequently site of various types of skin cancers due to its constant exposure to the sun. When reconstructive surgery is needed due to damage, simply pulling the skin tighter over the area can change the ear shape, just as stretching the wrong area of skin near the nose too tightly can deform the tip. The answer is a more advanced procedure which involves Dr. Parker skillfully releasing skin and cartilage along the rim of the ear, which can then be advanced together to fill the hole. The resulting scar is almost imperceptible and makes the procedure our standard for most skin cancers along the rim of the ear. Just as there is very little extra skin to work with on the tip of your nose, such is the case around the nostrils. And as with the tip of the nose, relying on procedures that involve stretching and pulling skin to cover the affected area will distort the shape of the nose and nostrils. Although skin grafts are sometimes the best choice, grafts are from other parts of the body and after healing don’t match tone, thickness, or texture of the facial skin. But with a nasolabial flap procedure, Dr. Parker can take advantage of the extra skin along the nasolabial fold, the crease along the junction of the cheek, nose, and lip. Using this nearby and closely matching skin is much more aesthetically pleasing, with the scar hidden along the crease. 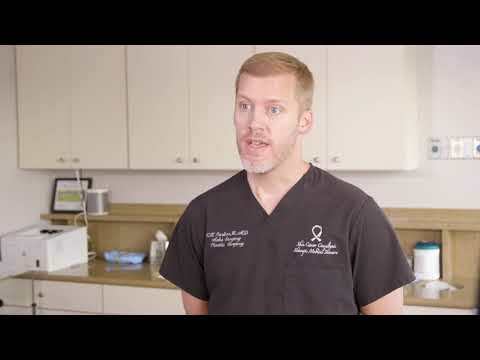 Dr. Parker, who is highly skilled at minimizing scarring, says “Tension is the enemy of good healing and minimal scarring.” So with his linear, straight-line repairs, he doesn’t just rely on surface stitches. Since underlying tension pulls the wound apart, he prefers to add one or two additional layers of deeper stitches under the surface, which bolsters the support of the wound and holds it together better as it heals. For complex repairs, he may also release parts of the skin from the underlying tissue to relieve more tension to provide a much preferred, finer, and smoother scar. If you believe you would benefit from flap surgery with minimal scarring, we invite you to call our office today to set up a consultation with the Skin Cancer Consultants team.